I've been reprimanded. Scolded even. No, not by my Mom. Not by my Hubby either (well, not regarding this. Spending money? Yes, he scolds me.) It was by my dermatologist. Yesterday, I went in for a 2nd laser treatment on the birthmark on my forehead (a small, round portwine stain). Yep, my health insurance is covering it 100%! The laser zapping is far less painful than even a bee sting. Anyway, after the procedure, the kind Dr. paused, looked me up and down (not in a dirty way, you sillies) and remarked, "I'll see you again at the end of summer. But I'm telling you right now, if your face is too dark, I won't be able to treat you at that time." Oops. He then instructed me that I need to go buy this and use it along with wearing a hat everytime I'm in the sun. Herein lies the problem folks. I'm vain. I admit it. I LIKE how I look with a tan. Way back when, I used to sunbathe like it was my job. My. Job. I never liked the look of a dark tan on anybody. To me it screams "unhealthy"....a bit of colour, not white, but not dark either, is nice. I wear SPF 45 if that tells you anything. Have fun on vacation! Don't worry about your tan! It's hard to avoid the sun at the beach and it feels great to get a little color in the summer. Wha!!! Wha!!! You don't wanna look like that? She's hawt! I use that sunblock...everyday! The past few years I stopped lounging in the sun so much, which is hard because we spend the summer at the beach. My hats are so big we don't need an umbrella. I use that sunscreen too...and a straw hat...while sitting under an umbrella. I decided over the last few years that I'd rather be pale than have wrinkles (which have started to maliciously appear on my forehead once I turned 35...blech). That's a good sunscreen, though. I use it on Elise. Not slimy or greasy. OMG! Totally know what you mean. I absolutely think I look SO MUCH better tan!! I actually (so bad to ever do this) but I actually remember in high school mixing baby oil WITH iodine! Was I that naive!? But even yesterday... I was sitting out trying to start that nice summer glow! So I know and feel your pain in trying to stay without sun this summer! As much as I hate to say it... I'm with you! I always feel healthier with just a little bit of color. Not too much but enough. My derm is a friend of mine and every time I see her out socially in the summer I find myself making excuses for my "tan" which for me is not much. I used to tan all the time...even though I was blonde (when I still had hair!) and pale-skinned, I could get an awesomely dark tan. And I never used sun block. But one day the sun made me blister and swell up...and I've been allergic to it ever since. I know what it's like to want a tan...just be careful. The sun can be so bad for you! She looks like most of the women here at the condos!! We're out here and it's always sunny so tan we are! I KNOW I look better with a little color! I just DON'T tan my face in my sun. I then put self-tanning lotion on it at night so my face can catch up with my body while I sleep! I feel your pain with the tanning thing. I loved to tan, that is until I met my now husband, and started taking the pill. My skin never reacted to the sun in the same way...instead of my face getting an amazing tan like it did Bh (before husband), it gets the lovely mask of pregnancy...and most of the time, I am not even pregnant. What is even worse is that after going off the pill, I thought I might be okay...no such luck. 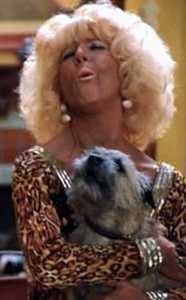 I have just decided to make bronzing powder my friend and call it a day! It's SO worth it though!! I've never really tanned because I have extremely fair skin, and I could never achieve a satisfactory tan without burning about a gazillion times first. I'm 38, and I look about ten years younger than my 34 year old SIL, who has been tanning weekly for 20 years. And my mother, who is fair skinned also, looks about 30 years younger than my MIL, whose skin looks like shoe leather. I recently had a real facial, and the aesthetician was oohing and aahing over my skin. It's very gratifying. I use that brand of SS and it's really good. Just do it. In twenty years you'll be thankful you did. My oldests dermatologist said to use Bull Frog under make up everyday but I am like you, I need the sun on my face!